Sarah Wale with Molly and a care home resident. With her glossy black and white coat, wagging tail and bright eyes, Molly is one of Kent and Medway NHS and Social Care Partnership Trust’s more unusual volunteers. 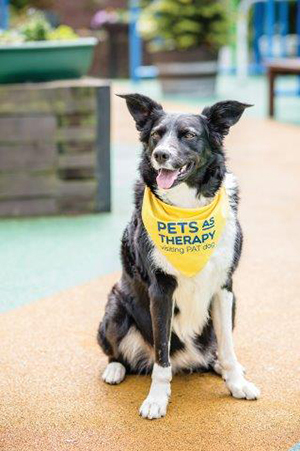 For the past three years, the eight-year-old border collie has been a therapy dog on the Heart’s Delight ward at the Frank Lloyd Unit nursing home in Sittingbourne, Kent, which supports older people with mental health problems and specialises in dementia. I am deputy ward manager on the unit and am also Molly’s owner. I’ve had her since she was a pup, and when the unit’s previous therapy dog left I had a eureka moment when I realised that my dog had just the right personality and temperament for the role. I approached the Pets as Therapy charity to register her as a therapy dog and we have never looked back. I am proud of the difference she has made to patient care. 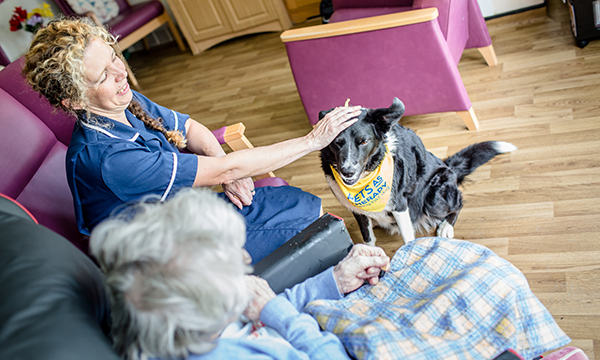 Molly wears a bright yellow bandana that identifies her as a therapy dog and has her own photograph on the staff board in the ward living room. She is a valued member of the team – Molly and I work together on shifts from 2pm to 9pm, with Molly taking part in staff handovers. Dementia often causes difficulties with communication, loss of engagement and isolation. Therapy dogs provide affection and comfort to people in settings such as care homes, helping to reduce feelings of isolation. Pets have been an important part of many residents’ lives. Being with Molly can stir memories, which often lead to powerful conversations with staff. I am proud of the strong bonds Molly has made with patients on the unit. One woman in particular finds it hard to engage with other patients and staff but she loves Molly. Her face lights up whenever she sees her, and she is like a different person when Molly is around. She feeds her biscuits, strokes her and plays ball. Her family told me that she used to have a border collie so that may be why she feels a strong connection with Molly. The wife of a new patient was anxious when visiting the Frank Lloyd Unit for the first time, and Molly sensed her anxiety. She seems to know when someone needs her, and made the woman feel so reassured that now whenever she visits her husband she brings presents for Molly. Moments like that bring real joy. Therapy dogs are undeterred by physical or mental illness, confusion or crying, and Molly brings fun, companionship and stimulation to the unit. Her ball games with residents, either on their own or as part of a group, are legendary. It is such a delight to see patients’ reactions when they see Molly. The lift in their mood is incredible. One of the wonderful things about Molly is that you don’t need to talk, and many of our patients experience great joy from just brushing or stroking her. Molly is a real character and gets involved in our parties at Christmas, when she wears reindeer antlers. We’re lucky to have her, but Molly also enjoys her time with patients and staff. Frank Lloyd is her second home. She lights up the lives of staff, patients and visitors and her work is part of the wider therapies offered to patients. The trust also uses therapy dogs in other settings, including the Grove rehabilitation centre in Ramsgate, which supports people with complex mental health issues. We were proud to make history on behalf of Pets as Therapy when Molly won a special mention award at the 2018 Unsung Hero Awards. The national awards recognise the dedication of non-clinical NHS staff, healthcare workers and volunteers to quality patient care, and it is the first time an animal has won an award. Molly and I attended the awards ceremony, held in Manchester in February, along with healthcare professionals from across the UK. 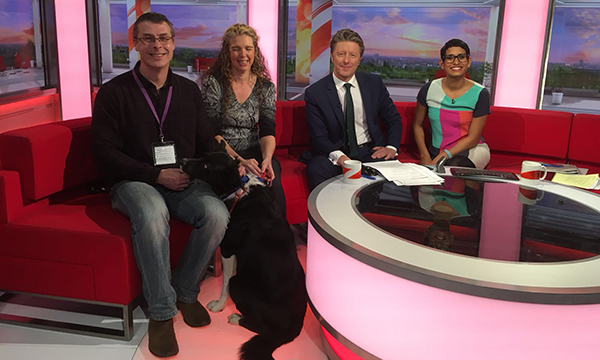 Media coverage generated by the award led to an appearance on BBC Breakfast television, a great platform to talk about the value of Pets as Therapy in patient care. I made a presentation about Molly’s work to senior management, and the trust has increased its commitment for inpatient wards to have access to Pets as Therapy. At this year’s RCN congress, starting on 12 May, a fringe event will discuss the role of dogs in supporting the health and well-being of people in healthcare settings. The RCN’s new protocol on this will provide essential guidance to health professionals and support an increase in the number of patients and staff able to enjoy the therapeutic benefits of dogs like Molly. It turns out that a cold wet nose, a friendly fuzzy face and a wagging tail can make just about anyone smile.